This award in one form or another has been in existence since 1966. Originally named the RVP Cup or the RVP Award, it is now referred to as The Carolina Best Clump Award. It is currently sponsored by Sandhills Daylily Club. The winner of the award is selected by registered attendees of the Region 15 summer meeting as a part of the garden tours. 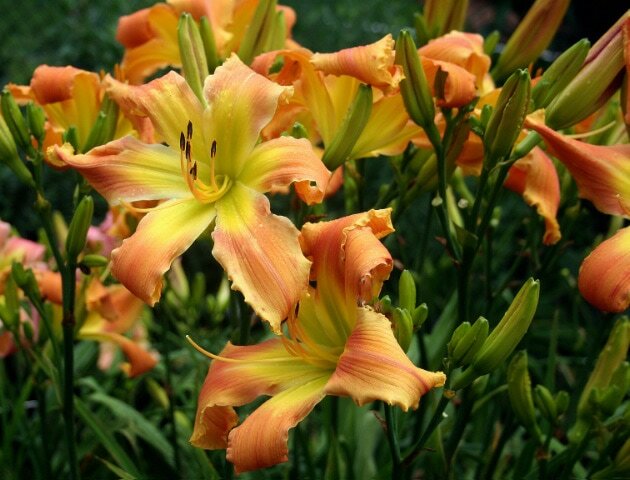 Garden hosts are expected to flag all daylily cultivars in their gardens that were hybridized by members of Region 15. Cultivars must be accurately labeled with the name of the cultivar and the name of the hybridizer. Attendees will be provided with ballots for this award. Ballots will be collected by the Awards Management Chair at the end of the garden tours and will be counted prior to that evening’s awards presentations. The garden owner(s) who grew the winning daylily will receive an appropriately chosen award presented by the president of the sponsoring club, or the president’s designee. The hybridizer who introduced the cultivar will receive a certificate of recognition, and his/her name, along with the name of the winning cultivar, will be added to the list of previous winners in The Carolina Best Clump Hall of Fame. A given cultivar can win the Carolina Best Clump Award only once. ** N.A. = Not Awarded. The national convention's President's Cup was given in lieu of the RVP award.